Saxo Bank-Tinkoff Bank has named the team of riders that will support Alberto Contador in his quest to win a second Vuelta a España, which starts on Saturday, August 18th. The Spanish rider, who recently returned from the ban imposed for his positive test for Clenbuterol at the 2010 Tour de France, won the race in his only previous appearance, in 2008, and is hoping to bounce back from his suspension in style. Contador’s ban ended on August 4th, and he returned to racing at the Eneco Tour, in Belgium and the Netherlands, where he currently sits in tenth overall. "We are entering this year's Vuelta a España with one overall goal, and that is to win the race with Alberto Contador,” explained team owner Bjarne Riis. “Alberto has made a solid comeback in Eneco Tour gaining some important race experience, he looked strong and seems ready and well prepared for the last Grand Tour of the season. 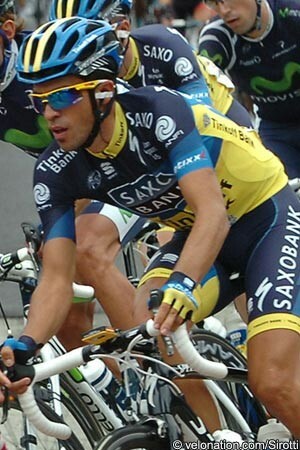 Saxo Bank-Tinkoff Bank had been built around Contador’s race-winning potential in the last two years, but his retrospective suspension saw the Danish team lose virtually all of its WorldTour points from 2011. The team has struggled to take points in the Spaniard’s absence and, subject to a possible appeal launched by Riis, any that Contador earns in the next two years will also not count. Nevertheless, the Danish team is putting its resources behind Contador’s bid for a second Vuelta title, although Riis knows that the competition will be fierce.